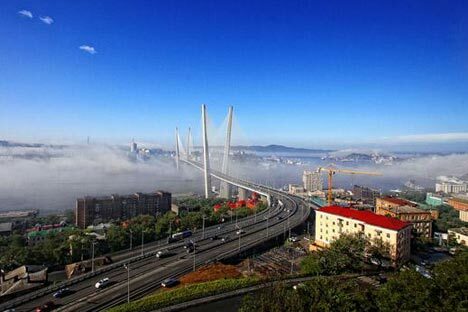 The Russian government is aiming to turn Vladivostok into “a centre of international cooperation in the Asia-Pacific.” The city constantly hosts various international events, including the 2012 APEC summit and Russia's first showcase music festival, V-ROX, in 2013. All sorts of city guides and photographic albums have been published, but their content is quite predictable: sea views, the newly built bridges, embankments, the port, museums and theatres. In reality, Vladivostok is an iceberg city. Its “underwater portion” is hidden from the initiated. RIR presents some of the lesser known attractions of the great city. Vladivostok is a military city. It is home to the headquarters of Russia's Pacific Fleet and to a number of military units. Numerous tunnels remain under the city from the Tsarist and Soviet times, many of them abandoned. Local diggers can offer you a thrilling excursion of the Vladivostok underground. On Russky Island, you will get to examine powder vaults built in the early 20th century, ruins left over from innumerable barracks, and remnants of Soviet warships which are rusting on the beach. There are not many really old houses in Vladivostok, which was founded slightly over 150 years ago. However, the city has its unique sites. There are, for example, the two buildings on Aleutskaya Street, done in Stalin's Empire style, which are locally, colloquially, and collectively known as ‘The Gray Horse’ for no apparent reason. In one of the horses, Vladivostok's best poet Gennady Lysenko took his own life in 1978. There are also the inimitable ochkurs, or back alleys, nooks and crannies. These are concentrated in the so-called Millionka district, once known for its rookeries, brothels, and opium parlours. One other old building, on Lazo Street, is known because Sergey Lazo, a famous Red Army leader, was arrested in it by Japanese interventionists in 1920 and subsequently executed. The same building was used in a book by Soviet author Yulian Semenov as one of the addresses of his spy protagonist Maksim Isayev/Vladimirov who gained nationwide fame as the main character in Semenov's other book (and then a TV series of the same name), Seventeen Moments of Spring. If you travel out of centre you will find yourself in one of the residential neighbourhoods, in which so-called gostinkas are abound. These grey, gloomy rectangular buildings with tiny apartments are inhabited by the deprived, the out-of-towners, the students and the drug addicts. The latter have an affinity to khimka, a smoking mix involving tobacco and hashish oil extracted from local cannabis. A tour of gostinkas offers Harlem-esque and East End-esque experiences, and may be equally thrilling and dangerous. The gostinkas inspired the art-house director Nikolay Khomeriki to shoot his’ Tale in the Darkness in Vladivostok.’ There are particularly many gostinkas in the city's outlying districts of Dalkhimprom, Zmeyinka, Tikhaya, and Churkin. (It should be noted that Churkin, located on the southern coast of Golden Horn bay, is being gentrified. It already has a new bridge and an opera theatre). Apart from gostinkas, Vladivostok, like any other Russian city, has its share of Khrushchevkas – five-storey buildings with small flats. Such buildings used to be erected all over the country in the early 1960s. One such Khrushchevka, on Sakhalinskaya Street, is a true monument to the gangster culture of the 1990s. One of its corners was blown up some 20 years ago in an attempt on the life of a local criminal kingpin, and has been restored in panels of mismatching colour. Not far from Sakhalinskaya, there is the Maritime Cemetery . Apart from the famous traveller Vladimir Arsenyev, the world's first female captain Anna Shchetinina, and crewmembers of the legendary cruiser Varyag, which sank in a battle with a Japanese squadron in 1904, the cemetery serves as the resting place of victims of 1990s criminal shootouts. Their graves are immediately recognizable for their gigantic size. One of the sights normally omitted from official guides of Vladivostok is the Green Corner market , which trades in used Japanese cars. It is here that numerous guests from Siberia and other Russian regions have been coming to buy cheap cars over the past 20 years. Trade in imported vehicles is not just a strong local industry; it is a way of life in Vladivostok, despite the different obstacles regularly put up by the federal government. The market is spread across several sоpkas (small mountains or hills) on the outskirts of the city. It is packed with cars, small cafes, etc. You can also buy contraband Japanese whiskey, brandy, and cigarettes. Green Corner also includes numerous garage compounds (metallic single-car garage shells, standing separately from residential buildings, are to the men of Vladivostok and the rest of Russia what sheds are to Britons, except they are used for meeting up with male friends and neighbours, cooking barbeques, and sometimes even for actually repairing your car). There are also junkyards, which trade in used car components. As an alternative to the expensive eateries of Vladivostok, whose restaurant prices are as high as those in Moscow, we recommend trying Chinese cuisine in one of the chifanki (from the Chinese chi fang, "to eat"), where you will be offered good-quality Chinese dishes, adapted to Russian tastes, at unprecedentedly low prices. Such joints can be found in any district of Vladivostok but are especially ubiquitous in the vicinity of the local Chinese market at Sportivnaya . Street fast food is represented by pyan-se, Korean steamed buns with a filling of cabbage and meat. One of Vladivostok's trademarks is its series of hills. Some of the hills are covered in multi-story buildings, such as Holodilnik (Fridge) sopka, one of the highest mountains around. There are still some Soviet-era artillery pieces left on the slopes of Holodilnik. The sopka offers some of the best views of the city.